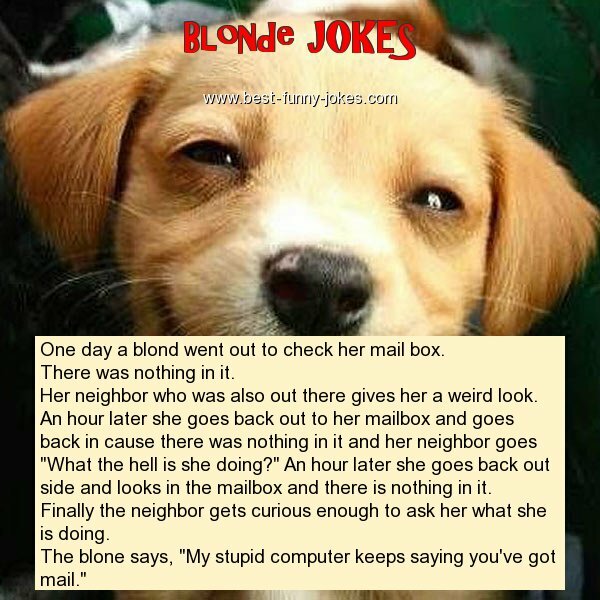 One day a blond went out to check her mail box. Her neighbor who was also out there gives her a weird look. An hour later she goes back out to her mailbox and goes back in cause there was nothing in it and her neighbor goes "What the hell is she doing?" An hour later she goes back out side and looks in the mailbox and there is nothing in it. Finally the neighbor gets curious enough to ask her what she is doing. The blone says, "My stupid computer keeps saying you've got mail."